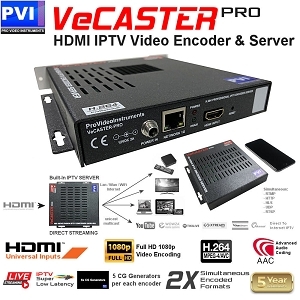 The VeCASTER PRO HD HEVC is a single channel HDMI Video To selectable HEVC H.265 or H.264 professional IPTV video encoders, ideal solution to distribute any full hd hdmi video directly to unlimited SMART TVs, Smart Phones, Tablets, Computers, IPTV Boxes, over LAN, WiFi, Internet.  The VeCASTER comes with a Built-In 1 gigabit hardware full-speed server capable to serve hundreds of concurrent TVs and players without requiring any additional part. Each VeCASTER connects directly to the existing LAN Switch, or wifi, or internet router and stream the HDMI Video input in super ultra low latency to any device, in unicast and multicast. One of the available streams can also be used to feed any additional distribution servers as YouTube, Wowza, Akamai, and any other, to reach even more audience, unlimited. In Homes, Commercial, Hospitality, a single VeCASTER can play directly on any SMART TV over wired Lan or Wifi, without need of any additional part behind the TV - Direct. 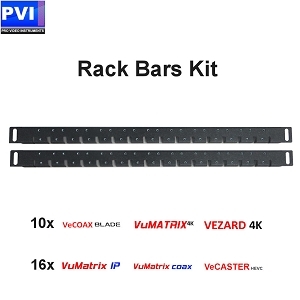 Multiple VeCASTER can be installed at the same time on the same distribution network, anywhere or grouped in a rack with our rack rails kit, adding and expanding the available IPTV Channels at any time. The VeCASTER is the ideal HDMI Video distribution component also in home and commercial automation application, providing the streaming directly to the TVs without additional components, with the ability to control the actual channel on the TVs using any automation remote control such as Logitec, Crestron, Control4, Alexa, and any other. The Automation simply commands the wanted television to switch to the wanted VeCASTER Stream, and the source to select the wanted channel, Easy. Thanks to the two included encoding engines and scalers, it is possible to encode the same HDMI video source in two different format and resolutions, as example for TVs and for any Mobile, making it natural and simple to reach out to any possible device anywhere on any network. Also Five Logo Generators allows to insert any channel or property logo, as well qr codes and text or graphic messages, in real time, without the need of additional components. Each encoder can be selected to operate with the classic H264 standard format or the new HEVC H.265 which takes up to five times less the bandwidth of classic H264 for the same visual quality. 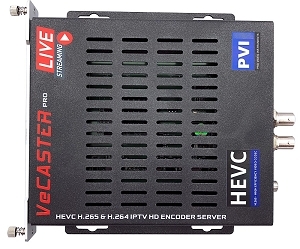 VeCASTER Pro is the perfect solution for any modern Full HD HEVC H.264 & H.264 HDMI to IPTV Unlimited ip streaming video distribution, delivering the best video quality, like never before. 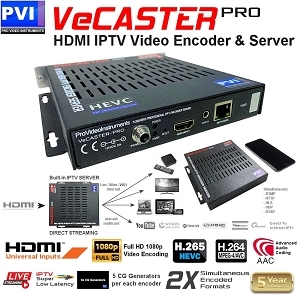 The VeCASTER PRO HD HEVC is a single channel HDMI Video To selectable HEVC H.265 & H.264 professional IPTV video encoders, ideal solution to distribute any full hd hdmi video directly to unlimited SMART TVs, Smart Phones, Tablets, Computers, IPTV Boxes, over LAN, WiFi, Internet. The VeCASTER comes with a Built-In 1 gigabit hardware full-speed server capable to serve hundreds of concurrent TVs and players without requiring any additional part. Each VeCASTER connects directly to the existing LAN Switch, or wifi, or internet router and stream the HDMI Video input in super ultra low latency to any device, in unicast and multicast. One of the available streams can also be used to feed any additional distribution servers as YouTube, Wowza, Akamai, and any other, to reach even more audience, unlimited. In Homes, Commercial, Hospitality, a single VeCASTER can play directly on any SMART TV over wired Lan or Wifi, without need of any additional part behind the TV - Direct. Multiple VeCASTER can be installed at the same time on the same distribution network, anywhere or grouped in a rack with our rack rails kit, adding and expanding the available IPTV Channels at any time. The VeCASTER is the ideal HDMI Video distribution component also in home and commercial automation application, providing the streaming directly to the TVs without additional components, with the ability to control the actual channel on the TVs using any automation remote control such as Logitec, Crestron, Control4, Alexa, and any other. The Automation simply commands the wanted television to switch to the wanted VeCASTER Stream, and the source to select the wanted channel, Easy. Thanks to the two included encoding engines and scalers, it is possible to encode the same HDMI video source in two different format and resolutions, as example for TVs and for any Mobile, making it natural and simple to reach out to any possible device anywhere on any network. Also Five Logo Generators allows to insert any channel or property logo, as well qr codes and text or graphic messages, in real time, without the need of additional components. Each encoder can be selected to operate with the classic H264 standard format or the new HEVC H.265 which takes up to five times less the bandwidth of classic H264 for the same visual quality. VeCASTER Pro is the perfect solution for any modern Full HD HDMI to IPTV Unlimited ip streaming video distribution, delivering the best video quality, like never before. 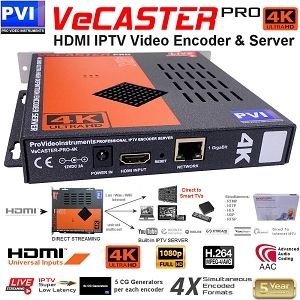 The VeCASTER PRO 4K H264 is a single channel ULTRA HIGH DEFINITION UHD HDMI2.0 Video To H.264 professional IPTV video encoders, ideal solution to distribute any 4K UHD HDMI video directly to unlimited 4K SMART TVs, Smart Phones, Tablets, Computers, IPTV Boxes, over LAN, WiFi, Internet. The VeCASTER comes with a Built-In 1 gigabit hardware full-speed server capable to serve hundreds of concurrent TVs and players without requiring any additional part. Each VeCASTER connects directly to the existing LAN Switch, or wifi, or internet router and stream the HDMI Video input in super ultra low latency to any device, in unicast and multicast. One of the available streams can also be used to feed any additional distribution servers as YouTube, Wowza, Akamai, and any other, to reach even more audience, unlimited. In Homes, Commercial, Hospitality, a single VeCASTER can play directly on any SMART TV over wired Lan or Wifi, without need of any additional part behind the TV - Direct. Multiple VeCASTER can be installed at the same time on the same distribution network, anywhere or grouped in a rack with our rack rails kit, adding and expanding the available IPTV Channels at any time. The VeCASTER is the ideal HDMI Video distribution component also in home and commercial automation application, providing the streaming directly to the TVs without additional components, with the ability to control the actual channel on the TVs using any automation remote control such as Logitec, Crestron, Control4, Alexa, and any other. The Automation simply commands the wanted television to switch to the wanted VeCASTER Stream, and the source to select the wanted channel, Easy. Thanks to the FOUR included encoding engines and scalers, it is possible to encode the same HDMI video source to 4K and another 3 different H264 formats and resolutions, as example for 4K TVs, Regular HD TVs, Tablets, and Phones, making it natural and simple to reach out to any possible device anywhere on any network. Also Five Logo Generators allows to insert any channel or property logo, as well qr codes and text or graphic messages, in real time, without the need of additional components. VeCASTER Pro 4K is the ultimate and perfect solution for any modern Multi Format / Multi-Rate HDMI to IPTV Unlimited ip streaming video distribution, delivering the best video quality, like never before.